It would be an understatement to say that Girls Trip was a blockbuster success this summer. And with an all-star lineup of black woman magic—Tiffany Haddish, Regina Hall, Jada Pinkett Smith and Queen Latifah—the film proved that black women can bring the funny and the money. 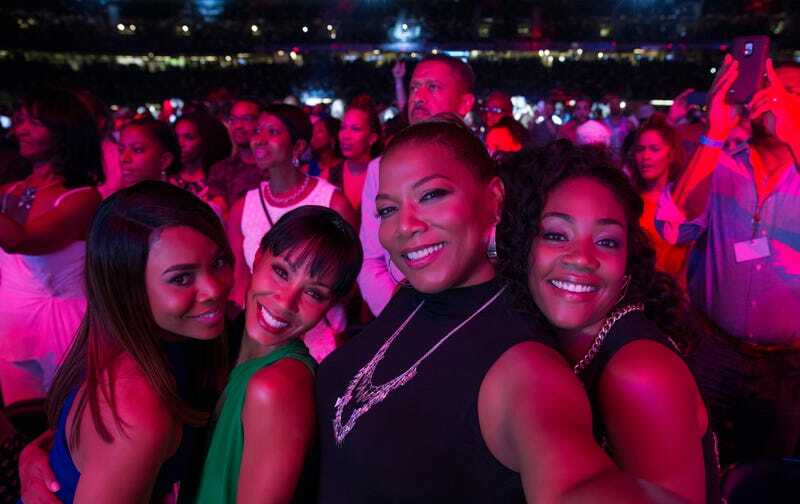 The actresses play four lifelong friends who call themselves the Flossy Posse and who, like many black women in July, make the trek to New Orleans for the Essence Festival. With sisterhood in full force, and shenanigans rampant, you’d think that all of the actresses were already acquainted beforehand, but that definitely wasn’t the case. However, even after filming, the women are still thicker than thieves. Of course, the film was shot during the Essence Festival, and Hall said that shooting there was only the second time she’d been to the festival. “It was different going with the movie, but it’s very nice seeing that many people coming together. It’s always fun, peaceful, and it is always hot. It has such a good intention behind it. It’s a party for three days if you want it,” Hall explains. When I joked that I had never been, Hall told me that I’d just have to get over the heat and humidity and make it down there to experience it myself. To date, Girls Trip has made more than $136 million and counting, and that’s not bad for a movie with a $28 million budget. Director Malcolm D. Lee (Best Man Holiday; Barbershop: The Next Cut) delivered an over-the-top laugh fest, which was produced by Will Packer. And it didn’t hurt that he had two of Hollywood’s shining stars, Kenya Barris (Black’ish) and Tracy Oliver (Barbershop: The Next Cut), pen a screenplay that kept the audience laughing. Many in Hollywood were shocked that the movie did so well, including Hall and Pinkett Smith. “I don’t know if we were expecting it. We definitely were having a lot of fun working together, and I knew that was special. I think we were excited and really wanted to make sure black women were represented properly. We wanted it to be funny and have a message. We’ve been so thrilled that it hit those buttons for people,” Hall says. Pinkett Smith isn’t unfamiliar with movies featuring an all-black female cast, especially when her filmography includes Set It Off. But Girls Trip definitely superseded the bank-heist movie and, of course, had a different tone. She says she was definitely surprised at the movie’s reception. “Once we were shooting, I knew that it had the potential of being something special. That was always the idea. Once I got on set, and I saw the chemistry between the four of us, I knew we had something. It was just a matter of what the audience was ready for,” Pinkett Smith tells The Root. When you watch Girls Trip, you can see the magic on the screen. The movie definitely presented black female friendships in a light that hasn’t been seen since Waiting to Exhale, and even the embattled friendships in Set It Off. Pinkett Smith says that the film was more than a “black” film in that it was relatable to other women. She says the movie has universal ideas that all women experience. “The rapport between the women, and the representation of the different types of personalities, definitely pushed the movie forward. The various issues we were all dealing with, no matter your color or economic status, were all relatable,” she says. But even with the universal themes, Pinkett Smith says she knows why the film was made and why it resonated with black women. “For black women, I feel that it was unapologetic, in regards to Black Girl Magic. I think that’s very rare. You got to see the many different colors of being African American. I don’t think we, as African-American women, get to see ourselves, in the different forms we come in,” Pinkett Smith says. Both Hall’s and Pinkett Smith’s careers have spanned decades. And even though both women have cemented their places in Hollywood, things could have turned out differently for both. What many people don’t realize is that Hall has a master’s degree in journalism from New York University, and if not for fellow actress Paula Jai Parker, she might never have decided on an acting career. “Acting wasn’t a goal, and it’s not because I didn’t want to do it. My mom’s a teacher and dad was an electrician. When I was in school, I told my friend [Paula Jai Parker], I needed to make extra money, and she was like, ‘You wanna call my manager? You can do commercials?’ I didn’t book anything, so I stopped. You can’t focus on grad school and try to do that. It was something that I really probably wanted to do, but it wasn’t a goal,” Hall notes. Even though she didn’t go to the school of the arts, like Pinkett Smith, Hall eventually found her footing in Hollywood. As for Pinkett Smith, she actually had her sights set on law school. “I was at University of North Carolina School of the Arts, and at the end of my freshman year, I told my mom that I went to Baltimore School of the Arts, and now this school, and I couldn’t get any more training that was going to prepare me for Hollywood. I told her I could either go to Hollywood for the summer or eventually law school, and she said, ‘Hollywood, here we come,’” Pinkett Smith says. With the success of Girls Trip, many of the movie’s fans are wondering if there’s going to be a sequel, and Pinkett Smith says that she feels there’s potential for one. “I was just talking to Tiffany [Haddish] about a sequel last night. We’re all down. Will material be created to match the first one? That’s really all the challenge. All of us are open to a second Girls Trip. Believe it. I have no doubt Kenya and Tracy can make it happen,” Pinkett Smith says. If you didn’t catch Girls Trip when it was released in the movie theaters, don’t fret. The movie arrived on digital Oct. 3 and on Blu-ray Disc, DVD and On Demand Tuesday with even more outrageous shenanigans, deleted and extended scenes, gag reels and more that will have everyone laughing. Needless to say, Girls Trip is just one of those movies that you’ll find yourself watching for years to come, because black-girl comedy magic isn’t going to expire anytime soon.